ILOILO CITY, Nov. 13 (PIA6) - - Executive Secretary Salvador Medialdea led the commemoration of the 100thdeath anniversary of General Martin Teofilo Delgado in the hero's hometown in Sta. Barbara, Iloilo on Monday, November 12. 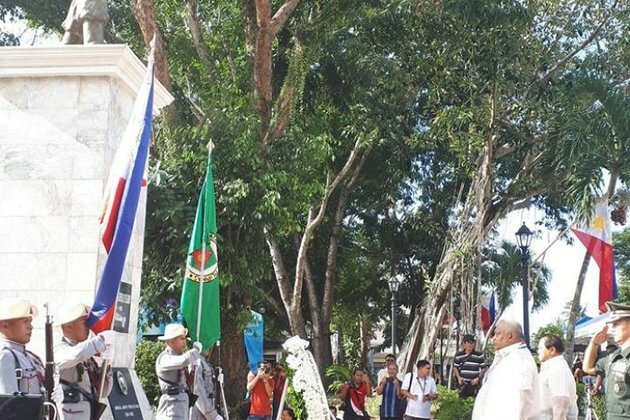 Medialdea was joined by National Historical Commission of the Philippines Acting Executive Director Ludovico Badoy during the flag raising and wreath-laying ceremonies held before the commemorative program that also took place at the town's plaza. In his message, Medialdea called on Ilonggos to remember the heroism of General Delgado and relive in their daily activities his bravery and love for country. "Naway magsilbing inspirasyon ang kanyang tapang at lakas ng loob upang maisulong ang kaunlaran at pagkakaisa para sa ating bansa, (May his bravery and valor serve as an inspiration to achieve progress and unity in our country)" said Medialdea. General Delgado, who died at the age of 60 years old in November 12, 1918, was the overall commander of the Revolutionary Forces in the whole Visayas and Mindanao during the revolution in 1896 and Filipino-American war in 1899-1901. Delgado was also the first civilian Governor of the province of Iloilo. Iloilo Governor Arthur Defensor also gave a short message during the program attended by kin of General Delgado, provincial and municipal officials, national government agencies' heads and representatives, senior citizens, teachers, media and students, among others. Defensor said General Martin Delgado fought for freedom and democracy. He fought for independence and a government that is transparent, clean and for the people. Meanwhile, the biggest flag outside Luzon, located in front of the Municipal Hall Building, which was raised earlier was later lowered to half-mast in honor of General Delgado. It was in Sta. Barbara plaza where the revolutionary leader first hoisted the Philippine flag in victory outside Luzon.